A deep penetrating oil/solvent based wood protective treatment, which offers a UV protected long lasting finish. Contains a biocide preserver to prevent mould/algae and decay. Approx coverage: 1 litre to 6-8m2. Hazard safety codes: R10-11, R51-53, R65-66. Wood Protective Treatment & Preserver 5L Clear is rated 4.8 out of 5 by 265. Rated 5 out of 5 by Useful Bloke from Quality wood protection I am a professional user of these products. 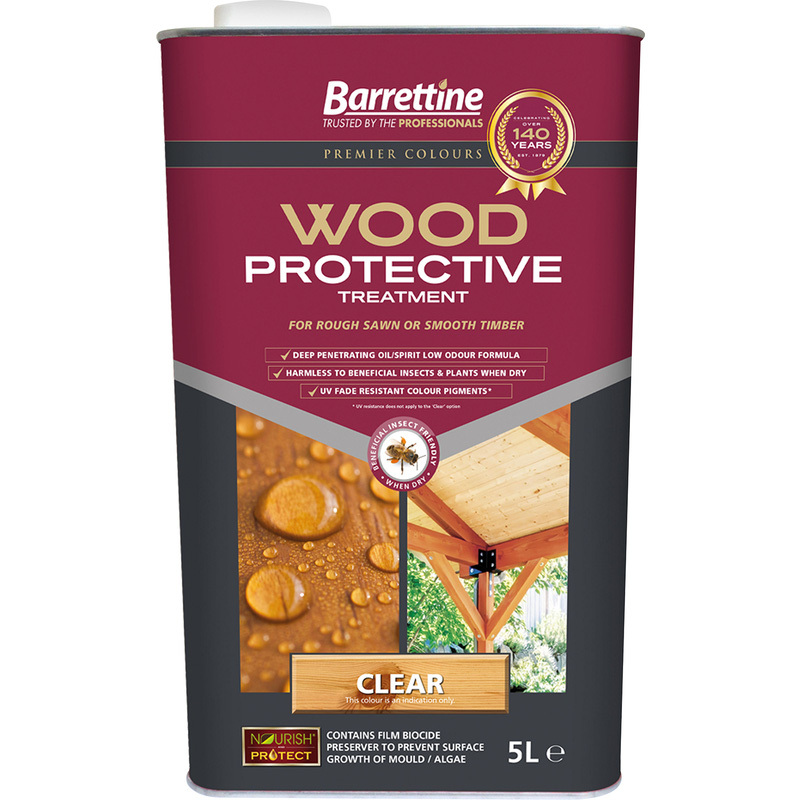 Barretine oil and spirit wood preservers offer excellent wood preservation over water based products. Its easy to work with, best brushed on for good coverage. Regular (annual) treatment with this product will protect and extend the life of your external timber, fencing, pergolas sheds etc. Don't use it on a windy day it will blow about! Rated 5 out of 5 by Tel JB from Protects well I’ve used this product for over 20 years now and found it protects very well and at least as well as products costing 50% more. Rated 4 out of 5 by JohnOfDerby from Appears to do what it says on the tin. I purchased this preservative to apply to a pot stand I recently constructed for our garden. Rain seen to puddle afterwards. Don't know yet how it will weather. Rated 5 out of 5 by LJB02 from Quality product This is the second year that I have used this product. It does exactly what it says on the tin and at a very reasonable price. If you want an oil based fence / wood preserver this is the one for you, it outlasts any of the popular water based products by a country mile. Easy to use, long lasting and a quality finish.